According to this article in the FT by Bhanu Baweja of UBS, the rise in the spread between the dollar 3-month LIBOR, now over 2.25% compared to 1.7% at the start of the year, and the overnight indexed swap (OIS) rate, as per the graph below, is a “red herring” and that “supply is at play here, not rising credit risk”. This view reflects the current market consensus, up until recently at least. Baweja argues that the spread widening is due to the increased T-bill-OIS spread because of increased yields due to widening fiscal deficits in the US and to the increased commercial paper (CP) to T-bill spread due to US company repatriations as a result of the Trump tax cuts. Although Baweja lists off the current bull arguments to be cheerful, he does acknowledge that an increasing LIBOR will impact US floating borrowers of $2.2 trillion of debt, half of whom are BB- and below, particularly if 3-month US LIBOR breaks past 3%. Baweja points to rises in term premiums as the real red flags to be looking out for. Analysts such as Matt Smith of Citi and Jonathan Garner of Morgan Stanley are not as nonchalant as the market consensus as articulated by Baweja. The potential for unintended consequences and/or imbalances in this tightening phase, out of the greatest monetary experiment every undertaken, is on many people’s minds, including mine. I cannot but help think of a pressure cooker with every US rate rise ratcheting the heat higher. 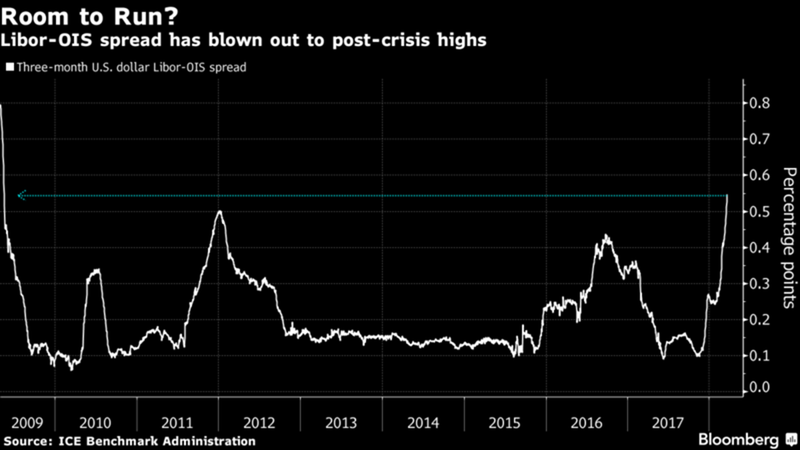 Citi worry that LIBOR may be a 3-month leading indicator for dollar strengthening which may send shock-waves across global risk markets, particularly if FX movements are disorderly. Garner believes that “we’re already looking at a significant tightening of monetary policy in the US and in addition China is tightening monetary policy at the same time and this joint tightening is a key reason why we are so cautious on markets”. Given Chairman Powell’s debut yesterday and the more hawkish tone in relation to 2019 and 2020 tightening, I’ll leave this subject on that note. The intricacies of credit market movements are not my area of expertise, so I’ll take council on this topic from people who know better. Eh, help Eddie….what do you think? This entry was posted in Economics, Equity Market and tagged Bhanu Baweja, Chairman Powell, China monetary policy, Citi, commercial paper, CP-T-bill spread, credit risk, dollar strength, fiscal deficits, hawkish tone, Jonathan Garner, LIBOR, LIBOR-OIS spread, Matt Smith, monetary experiments, monetary tightening, Morgan Stanley, OIS, overnight indexed swap, spread widening, T-bill-OIS, term premiums, UBS, unintended consequences, US floating debt. Bookmark the permalink. Happy to chime in, Mozoz. Increased CP issuance would explain higher LIBOR rates and a higher LIBOR-OIS spread. On the other hand, declining bonds prices and higher spreads let me assume that credit risk is creeping higher. The early stages of rising LIBOR were not that interesting imo since (at least in high yield land) loans usually have LIBOR floors at 1% or so. But now we are comfortably above those floors… combine that with highly levered balance sheets and record low interest rates (thus high interest coverage so far) and we have an interesting situation. I personally wonder that HYG is not moving more or faster since I would expect higher risks there. This is still early stages, to be sure, but something I watch closely. A quarter or two with 3M LIBOR above 2% or, heaven forbid, 3% probably won’t spell immediate doom (famous last words!). Longer term this might be become a serious issue, though. Seems to be something to keep a close eye on. Interesting FT article today on US BBB debt volumes, now about half of all investment grade!! CVS insisted it would reduce its leverage to about 3.5 times in the first two years after the deal, echoing promises made by other companies that have increased the number of debt-funded M&A deals that earn investment-grade ratings. Make me chaste lord but not yet… this will become relevant once we see some serious downgrades. Many players can buy IG paper, but not that many can buy HY paper, i.e. less liquidity and higher spreads once you cross the boundary. This could put some people in a pretty tight spot.